The PARO Centre for Women’s Enterprise (PARO) officially celebrated its 20th year on Thursday November 13th, 2014. ‘Exceeding the Vision’, a full day event, was held in Thunder Bay drawing hundreds of participants to mark the occasion. Exceeding the Vision is PARO’s way of celebrating with the community. Participants had the opportunity to engage with Northern women in business, attend a tradeshow event, and hear a keynote address from singer-songwriter Buffy Sainte-Marie. Buffy will discuss her career highs, including her appearance on Sesame Street, earning an Academy Award and creating the Cradleboard Teaching project, as well as the lows of struggling with music dyslexia and dealing with the backlash that comes along with fame. Power panels featuring successful women from across he region were a main draw at the event. The power panels focused on "What’s Hot and what’s Not" in regards to four different pillars. These pillars include: Procurement, Productivity and Profitability, Youth and Social Entrepreneurship, and Circles, Clusters and Leadership. The panelists shared what they have learned from their experience. Rosalind Lockyer, Executive Director of Paro: "It has been a wonderful journey and a lot of people have come with me on that journey. It is amazing what we accomplished in those 20 years and that is what we are celebrating. All the businesses that were started and all the jobs that were created and the people that are paying it forward every day in our communities." " The award winners are the top 20 women over 20 years, women who have given back in so many ways, not only being successful in their own businesses but in giving back to others. That is what it is all about. We will have lunch with Buffy Sainte Marie speaking which will be a real thrill and power panels on how to succeed in business. In the evening all the award winners will talk about their journey with Paro. We had 70 nominations and 4 judges chose the top 20." " We have had many entrepreneurs start their business which is wonderful impact. Last year alone they created over 500 jobs, which is significant, and we leveraged over $4 million in grants to the entrepreneurs. It is a big economic impact. We are asking the women today their dreams going forward for Paro." " Buffy is a powerful women and every song she writes is very powerful. We felt it was important to have Buffy talk about her life and the things she learned. She did a wonderful job. Her philosophy of life is what Paro is all about. It is not necessarily about making money but women living in a community together and helping each other and becoming stronger. Women are 50% of the population and we think differently and bring a different message. It is not any more or less important but we need to know that. There are not enough women in politics or business. Don’t complain when people don’t understand everything about you. Make your own recipe and then serve it out to people is a message from Buffy. Everything thought I was crazy in Paro giving out small loans and having women work together in groups but it has worked over 20 years!" 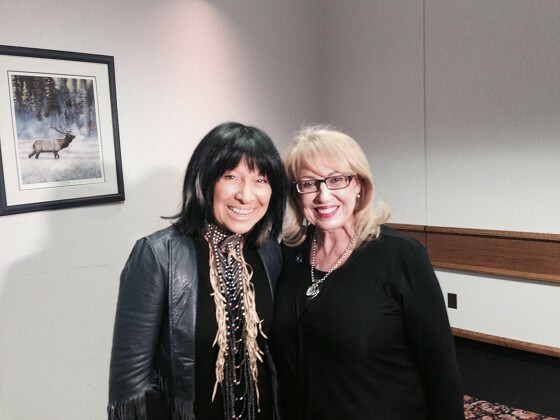 Buffy Saint Marie song up where we belong won an Academy Award.
" My message would be keep coming to organizations like this Paro to spend some time with women that are benefiting their businesses and the world at large. Most cultures have only used 49% of the brainpower and left women behind. The world will be better off using everyone’s perspectives. There have also been a handful of women around certainly since the 60’s where I started out like Gloria Stenham and so many more. As I travel around I see more and more women having an impact and we need to reach people locally. Women’s brainpower influence is to be felt." " The closest I got to being in business was with my foundation. When I was 23 as a young singer there was too much money and I wanted to fill in the blanks. In aboriginal communities many would like to go to college but have no idea how to negotiate the path to get there. I started a scholarship foundation in the late 60’s and my biggest success was when I found two of my grantees went on to run tribal colleges- so that is the big success. It was an investment of my left over singing money. I try to get out of business. I’m not too crazy about business. I am a visionary but not an administrator. I like to give away ideas and see other people develop them. Its like when someone else sings your song and wins an academy award." " We put together a band in Winnipeg of aboriginal players after my last album and we have been on a 5 year tour! I spend my time going from Hawaii to concerts to Toronto. Since May I have been in Toronto and finishing up a new album. It is very creative. It has been 50 years now in music and maybe I will be on another world tour. It is such a privilege to reach people with music and to hear back it does them some good. It is a mission."